Delia Grace introduces the participants of the Safe Food, Fair Food 2 inception workshop to ILRI staff at Friday Morning Coffee (photo credit: ILRI/Kristina Rösel). On 12–13 April 2012, the Nairobi campus of the International Livestock Research Institute (ILRI) hosted an inception meeting for the BMZ/GIZ-funded, ILRI-led Safe Food, Fair Food project to develop action plans for the second 3-year phase of the project to build on previous work from 2008-11. Present at the inception meeting were project partners from Côte d’Ivoire (Centre Suisse de Recherches Scientifiques), Ethiopia (Addis Ababa University), Germany (Federal Institute for Risk Assessment [BfR] and Free University of Berlin), Ghana (University of Ghana), Japan (Rakuno Gakuen University), Kenya (University of Nairobi), Mozambique (Agriculture Research Institute of Mozambique), Tanzania (Sokoine University of Agriculture) and Uganda (Makerere University). During the first phase of the project, a number of studies on participatory risk analysis were carried out in eastern, southern and West Africa. The project also held national workshops to engage policymakers to raise awareness about the potential food safety hazards that exist along the entire value chain. Findings from the project also featured prominently at the first International Congress on Pathogens at the Human-Animal Interface (ICOPHAI) held in September 2011 in Addis Ababa, Ethiopia where some 25 oral and poster presentations were made by researchers and MSc and PhD students attached to the project. 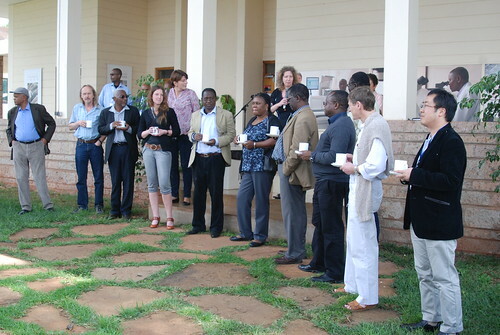 Also in September 2011, the project held its final synthesis workshop to deliberate on the results of national impact assessment studies and develop a project synthesis book which will facilitate dissemination of the research findings to wider audiences. The project now moves into its second phase which will adopt an action research approach for stakeholder engagement at the regional level towards uptake of tools and approaches to enhance food safety in informal markets in Africa. Tags: meeting. Bookmark the permalink.